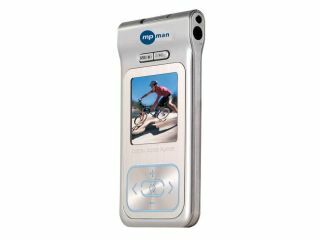 Korean firm MPman , which claims to have built the world's first MP3 player in 1997, has launched an interesting new device called 'The Blade'. It's a petite player, with a 1.5-inch screen and a body that's only 7mm thick. It performs all the usual MP3 player standards - it plays MP3s (d'uh! ), as well as WMA files including those with DRM protection, and OGG formats. Despite its slim build, it can play video and you can view JPG images. It's available in 1GB and 2GB sizes and the thing we like most about it is that it has two 3.5mm headphone jacks. Yes that's right: the dual headphone sockets we used to get on cassette Walkmans and the like have reappeared on the MPman Blade. And it's about time too, why more MP3 manufacturers don't incorporate two headphone jacks is beyond us; it makes it much easier to share music without having to buy a splitter. You can get one of these for around £80.